Flávia Davit, M.D. is a plastic surgeon originally from Brazil where she received her Medical Degree from the Universidade Federal do Ceará in her hometown of Fortaleza. After medical school, Dr. Davit completed her Brazilian Plastic Surgery residency at the Hospital Universitário Walter Cantídio of the Universidade Federal do Ceará, and graduated in 2001. She went on to pass her written and oral board examinations in Plastic Surgery for the Brazilian Board of Plastic Surgery later the same year. While still a resident in plastic surgery in Brazil, Dr. Davit met her future husband during an Operation Smile mission to her hometown. During this trip, they found that their interests in work and life were quite similar, and were happily married in 2002. Dr. Davit moved to the United States, and began the challenging process of re-training and re-certifying in the American medical system. 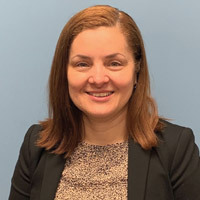 After studying in the United States for several years and passing the prerequisite exams, Dr. Davit went to Conemaugh Memorial Hospital in Johnstown, PA for her General Surgery residency where she obtained significant experience in trauma and breast surgery. She has been a Diplomate of the American Board of Surgery since 2011. Dr. Davit completed her Plastic Surgery residency at The University of Pittsburgh in 2014. During her Plastic Surgery training, Dr. Davit was fortunate to receive extensive specialty experience in breast reconstruction, aesthetic breast surgery, abdominoplasty, body contouring, liposculpture, and skin cancer procedures. She has a particular interest in aesthetic procedures for facial, breast, and body rejuvenation. Her experience in both the Brazilian and American disciplines of Plastic Surgery have given her a unique experience in combining the techniques of both cultures to address each patient's unique surgical goals. Dr. Davit is Board Certified by the American Board of Plastic Surgery. She and her family enjoy all that Pittsburgh has to offer, including ballet, ice hockey, music and art.